Barnacle plots at Stairs consist solely of Chthamalus fissus/dalli (note that species were not distinguished until 2001). Barnacle cover remained fairly high until 1997/1998, when both a large El Niño event and an oil spill impacted the site, and may have affected barnacles (see discussion below and “Publications and Data Products” section). Barnacle cover continued to plummet until around 1999/2000, when levels in all plots were less than 10%. Unfortunately, the slight recovery that was seen in four plots beginning in 2004, did not persist. No other species was recorded at any significant level within these plots. Limpets and littorines were present in the barnacle plots at Stairs, but were not as abundant as at most other sites. Mytilus californianus cover in mussel plots was quite high until 1997, when Stairs was hit hard by a series of large-wave events associated with the 1997/98 El Niño. Mussels were likely stressed by the warmer water, and were ripped out in two plots by large waves. Some recovery has occurred in these plots over time, but slow, steady decline in two other plots has resulted in a mean cover of around 40% since 1998. In addition, a large wave event in the winter of 2002/03 altered the rock surface in plot 2 and to date the plot has not recovered. Species filling in the available space within mussel plots include: Mazzaella spp, articulated corallines, and non-coralline crusts (crustose forms of non-coralline red algae). Limpets were by far the most common motile invertebrate present in mussel plots at Stairs. Other species present included the snails, Tegula funebralis, Nucella spp. (mostly N. emarginata/ostrina) and littorines, and the chiton, Nuttallina spp. 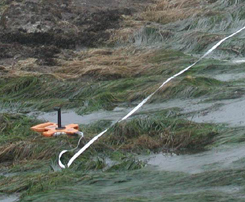 Cover of the rockweed, Silvetia, within plots where it was targeted was initially high, and then declined somewhat in 1995. As with most other species at Stairs, Silvetia was severely impacted by the 1997/98 El Niño event, and cover declined and then stabilized (with seasonal variation) at around 25%. This decline was accompanied by a slight increase of Endocladia, but rock cover also increased, indicating that some open space was not colonized by other species. Non-coralline crusts increased in several plots, and another rockweed, Fucus, colonized one plot. Although Silvetia cover has declined in the plots, it is common at the site overall. In fact, Stairs is one of the only sites in the entire MARINe network where all four west-coast rockweed species are present (Pelvetiopsis, Hesperophycus, Silvetia, and Fucus). Limpets and the turban snail, Tegula funebralis, were the most common species found within Silvetia plots at Stairs. Littorines were also present. Endocladia cover in the Endocladia plots remained relatively constant through 2009, with strong seasonal variation (higher in spring). This seasonal fluctuation is typical of Endocladia and was observed at other sites. In 2009 Endocladia cover declined and then stabilized at around 30%. Limpets and littorines were abundant in these high intertidal plots. “Recovery” plots were established after the 1997/98 El Niño event, when huge sections of reef (up to 17m x 5m) were removed by extreme wave events, leaving several large, newly exposed areas of bare rock. These natural clearings provided us with a unique opportunity to document community succession in the mid-intertidal. Nearly all succession studies are done in artificially cleared patches, which are small relative to the reef size and often recover via encroachment by surrounding species. Because newly exposed sections of reef at Stairs were so large, they were likely to “recover” via colonization by propagules and thus had the potential to develop into communities quite different from surrounding, undisturbed areas. Eight recovery plots were originally set-up, but four have been lost over time due to subsequent large-wave events that have removed additional sections of reef. “Non-coralline crusts”, the crustose forms of red and brown algae, were among the earliest colonizers of these completely bare plots. In these plots, non-coralline crusts consisted primarily of Ralfsia spp., Petrospongium rugosum, and the crustose form of Mastocarpus (formerly called “Petrocelis”). Unexpectedly, the green alga, Cladophora, also colonized a few plots early on and then disappeared. 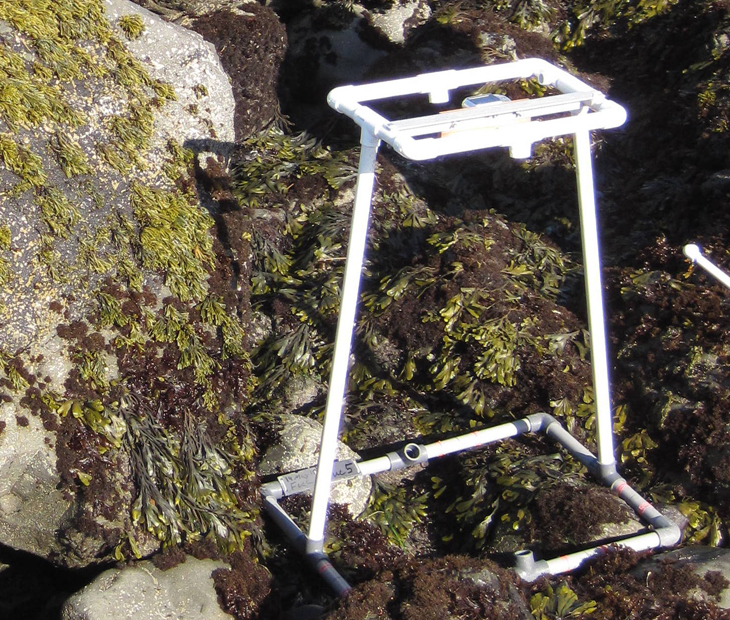 Non-coralline crusts have persisted in all remaining recovery plots, and the rockweed, Silvetia has also moved in and steadily increased over time. A significant amount of bare rock is still present, so it is likely that it will be several more years before these plots reach a “stable state”. Surfgrass (Phyllospadix) was impacted more than any other species by the 1997/98 El Niño event, experiencing a nearly 80% loss between fall 1997 (pre-storm destruction) and spring 1998 (post-destruction). Surfgrass grows from rhizome-like holdfasts, and has difficultly re-establishing itself once these holdfasts have been removed. The large wave events associated with the El Niño storms ripped out nearly all rhizomes, and even removed large sections of rock within the transects where surfgrass is sampled. Thus, it is surprising and encouraging that surfgrass has been steadily recovering in the years following this destructive event. Only two transects were sampled in fall 1998. Pisaster (ochre star) numbers have fluctuated substantially at Stairs, and appeared to be declining between 2008-2013. 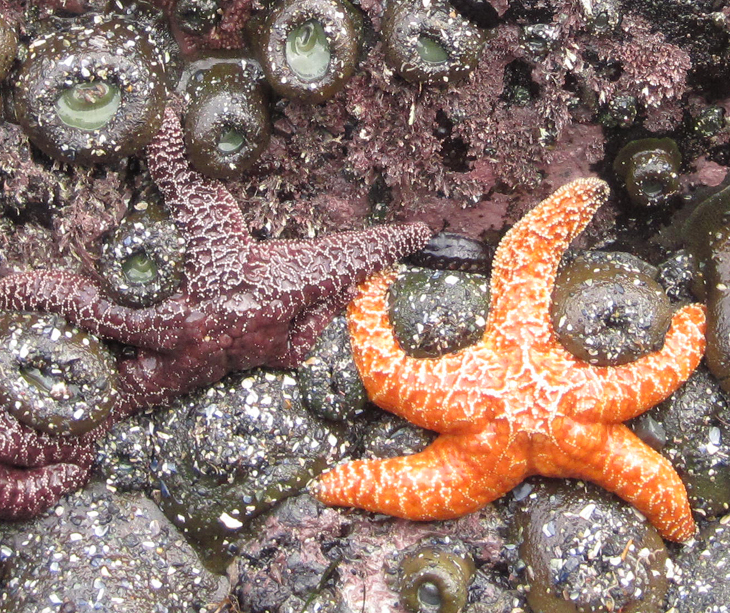 In 2014 numbers were further reduced by sea star wasting syndrome. Pisaster sizes have generally been fairly evenly distributed for most samples, with radius measurements between 30mm-130mm, indicating good recruitment and retention of adults. Hopefully this indicates that continued recruitment will occur, and sea star numbers will slowly recover.